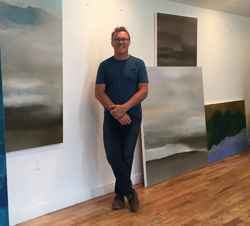 "My work is driven by my overriding passion for the enhancement of the process, combined with ebb and flow of life, both conscious and subconscious, as well as the effect of light, tone and color presented to us throughout our precious natural environments. I am greatly inspired by the natural world, its collective moods and weather patterns, which envelop us daily in so many varied land, sea and sky settings throughout North America. As I paint, I am consistently influenced by these natural & ethereal experiences and remain highly focused on creating works that reflect these elements in so many different forms."